Meet the newest addition to the Robinson family! His name is Tucker and he’s 3 months old. 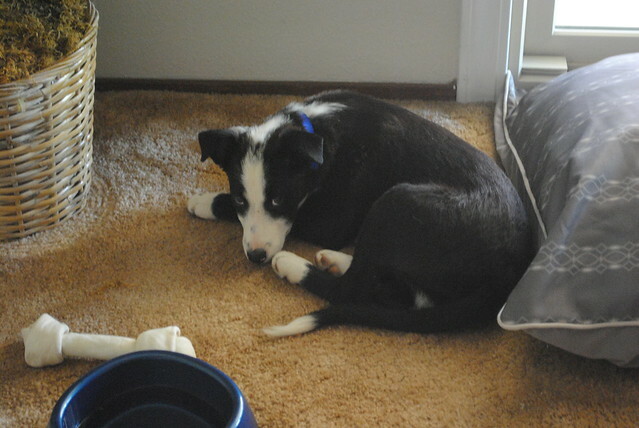 He’s really shy, mainly because he went from being on a cattle ranch with 10 other dogs to a small home with two cats. He’s adapting very well, getting a little livelier each day. He starts Puppy Education training at PetSmart next Saturday. As for the cats, it’s been great that Tucker is very shy and not in their faces; it’s allowing the cats to get used to him, and if anything I think Tucker is a bit more scared of the cats than they are of him.